St. Clairsville, OH (May 1, 2018) —Belmont College is pleased to announce that 21 students were recently inducted into Beta Theta Mu, Belmont’s chapter of Phi Theta Kappa (PTK). Induction into PTK, one of the most prestigious international honor societies in the country, recognizes academic achievement of students at two-year colleges. A grade point average of at least 3.75 is required for induction into PTK and the student is required to maintain a 3.5 GPA. 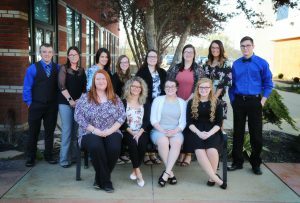 Belmont College Spring 2018 Phi Theta Kappa inductees (front row:) Ashley Vargo; Adrianna Walton; Sydnee Hartley; Sydney Schuerman; (back row): Samuel Blake; Chastin Reed; Linda Wisvari; Krysila Baratie; Carleigh Turkoly; Brianna Greig; Olivia Gauding; and Aaron Conrad. PTK’s mission is to recognize and encourage the academic achievement of students and provide them with opportunities for individual growth and development through participation in honors, leadership, service, and fellowship programming. Woodsfield: Olivia Gauding; Sydney Schuerman.